Yesterday my cousin Phil was elected president of the New Bedford Port Society at the Annual General Meeting. He’s a good guy who will bring some new energy to this 179 year old organization. I was also accepted as a member and look forward to helping any way I can. During the years 1828 – 1829 when the whaling industry of New Bedford was at its height, a number of the city’s leading citizens gave their deep consideration to the “character building” of nearly five thousand seamen employed out of this port. Accordingly, on June 2, 1830 they organized under the title of the New Bedford Port Society, for the moral improvement of seamen and later became incorporated under the following act: An Act To Incorporate The New Bedford Port Society For The Moral Improvement Of Seamen. 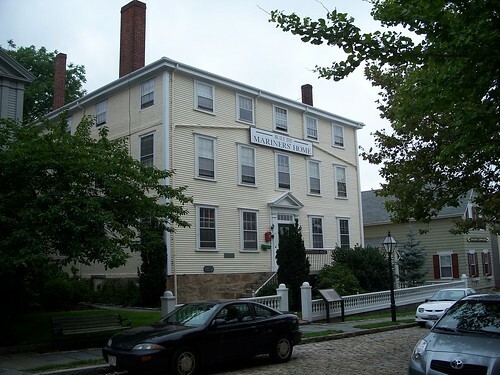 Across the street from the great New Bedford Whaling Museum, the New Bedford Port Society is responsible for 2 very important historic buildings located in the heart of the National Park: Seamen’s Bethel and The Mariner’s Home. As the whaling industry grew, more and more men were needed to man the many whaleships leaving the port. At various times, the number of seamen in Bedford Village ranged from 5,000 to 10,000 — nearly equaling the population of the village! The lives of these whale men were quite a contrast to those of the local citizens. Whale men sought out gambling dens, brothels, saloons, and dance halls — establishments which, as the leading citizens observed, were “detrimental to the dignity and good order of our community.” In addition, Quaker whaling merchants were concerned that the whale men spent the wages of a multi-year voyage in just a few days on such pursuits, leaving them broke and without means of support. What to do? In 1830, the leading citizens of the town met to discuss the situation and as a result of that meeting the New Bedford Port Society for the Moral Improvement of Seamen was organized. They immediately offered church services to whale men before they shipped out on whaling voyages. Services were held either down at the waterfront or in the Town Hall. The long-term impracticality of waterfront services and the difficulty of constantly arranging to use the Town Hall soon led the Port Society to conclude that they needed their own building. 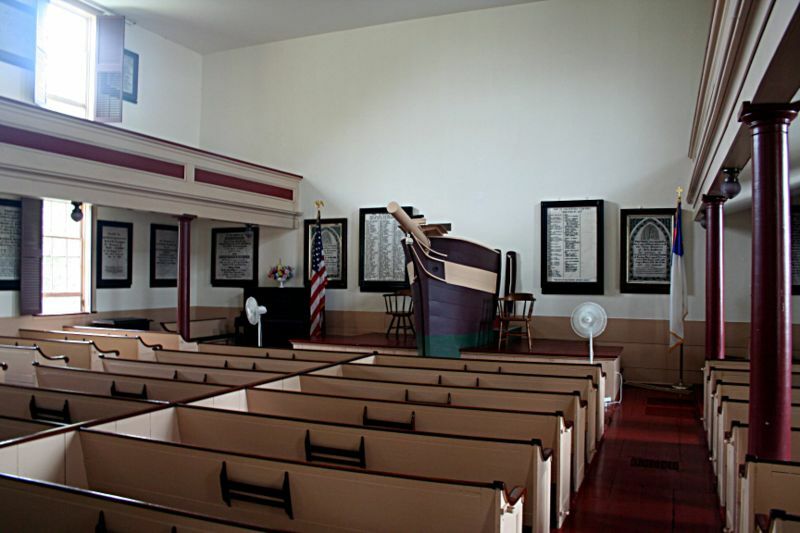 In 1832, the Seamen’s Bethel was dedicated as a nondenominational church and serves today in that capacity. For more than 150 years, the Mariner’s Home has provided a clean, comfortable place to stay for transient seamen who need shelter in the port of New Bedford. The Mariner’s Home is operated by the New Bedford Port Society, which charges only a nominal cost for a temporary stay. The Home is not open to the general public. Last night I received a note from a friend via Facebook congratulating me on becoming a member of the New Bedford Port Society but asking what it really means. Well, to me it means a number of different things. First, while New Bedford has changed a lot since the whaling days when the Port Society was originally founded, it still remains a vibrant port with many in the local area still making a living working with the sea. Both the Bethel and the Mariner’s home continue to perform the important duties with which they were originally charged. While some things stay the same others change. During all this time the New Bedford Port Society was fulfilling it’s social mission, it’s architecture became more and more important, especially from a maritime heritage point of view. These buildings not only represent an important period of New Bedford’s past, they preserve capture the spirit of our nation’s rich maritime heritage and you can feel it when you enter them. In their dual purpose, helping those in need and historic preservation, they remain authentic to the Port Society’s mission. These are working buildings with stories to tell. And fortunately Herman Melville told a few in his day. As a former mariner who grew up in the New Bedford area, these building might have a little more significance to me than the average person. But each year thousands of visitors cross their thresholds and have their lives enriched in a variety of different ways from the experience. 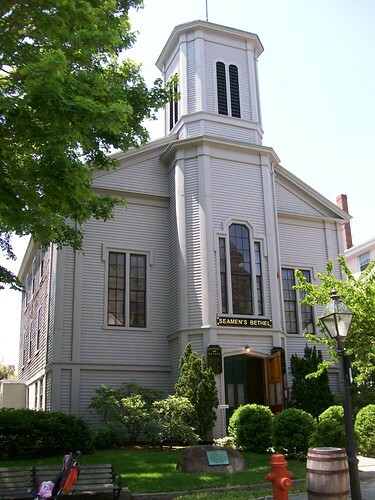 If you are ever passing through New Bedford, make sure you find time to make a stop in the historic district, even if it’s only to take a quick stroll up Johnny Cake Hill. I think you’ll see what I mean if you do. Look forward to you coming to New Bedford and getting together. thanks for this reminder that it’s been far too long ago that i was last in new bedford. Previous Previous post: Foto Friday – Happy Halloween!